We have returned… exhausted! Our Alaskan cruise was not so relaxing for me. With my husband’s family and our kids in tow and not much time to discover the historic ports due to ship schedule and excursions, I often felt rushed and we were definitely not happy with the trouble we had with our flights to and from Vancouver. However, we all still had a good time and enjoyed being together as we rarely get the chance to do. The key to a happy group vacation is to not make a point of sticking together. Our girls went off with their grandma to a dog sled camp and had a grand time petting puppies, marveling at the excitement and strength of the small mixed-breed dogs, and being pulled on a land sled (and getting mud spattered!). I am not shy about going off by myself to do things no one else is interested in. Some of us enjoyed shopping, some played the casino. We shared our stories at gourmet dinners while being pampered by the most friendly, impeccably mannered, multinational waiters. I carried along a pocket-sized notebook to capture any thoughts, but ended up using it mostly for jotting down notes from the interesting cruise lectures, one on the Alaska pipeline and one given by an Alaska Native on his culture. I did purposefully stop several times in front of spectacular scenery to contemplate the wonder of nature and gather thoughts of what I was feeling at the moment, but decided that the many photos we were taking, sad second-hand images that they are compared to real life, would be enough to bring back memories and thoughts at more relaxed times. Marlys Styne in SeniorWriting, her short and encouraging book for beginning lifewriters, suggests looking at photos to stimulate the memory, which is an excellent tip for opening up nests of stories and feelings. MS Movie Maker, available on newer pc computers, will help me make a movie clip with photos, music, and some digital camera video to bring our cruise back to life to be enjoyed again. (MACs have iMovie.) 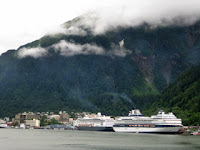 I’ll also add photos to the album of the first Alaskan cruise my husband and I took seven years ago (without kids). While I don’t scrapbook, per se, I have taken to using scrapbooking techniques in my photo albums, which is a great compromise for those of us without the time to do real scrapbooking. The only important photo I didn’t take is one of Canadian money. My youngest daughter thought that getting Canadian change in Vancouver airport was one of the highlights of our trip. Go figure. This entry was posted in capturing memories, family vacation, photos. Bookmark the permalink. Thanks for reminding me of my Alaskan cruise with my husband some years ago. It’s one I still remember, and I am inspired to look at the pictures again. Thanks for mentioning “Seniorwriting,” too, even though you did misspell my last name (I’ll forgive that). I made some interesting combination photo albums and scrapbooks from many trips before I switched to digital photography. In some ways, the old way was better, but I ran out of storage room! Too many trips? Ouch! Sorry Marlys STYNE! Isn’t Alaska great? And cruises are fabulous, esp for those who need a rest. Even if I did feel rushed some this time around, I still loved the whole experience.The photos just do not do Alaska justice, but do serve to bring back the remembrance of great beauty and fun. I just fixed your name in the post, Marlys. I too have lot’s of sweet memories from my family vacation trips.